Italian accessory manufacturer Manfrotto has introduced three improved LED panels that are designed to be used by professional and serious enthusiasts in the hot shoes of their cameras. The new panels, which are powered by Litepanels, are the CROMA2, MICROPRO2 and the SPECTRA2. 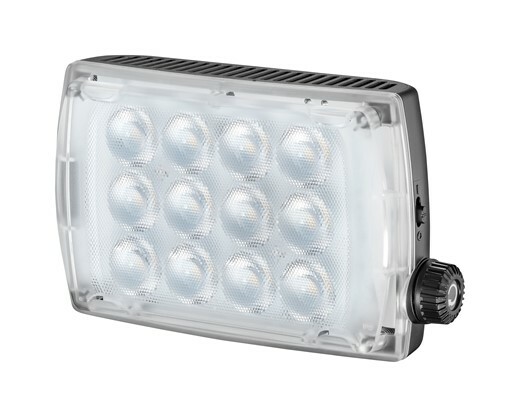 Each of the new models features surface-mounted LEDs, with new lenses that improve the intensity of illumination in the light path thus delivering better efficiency and less fall-off. The company also says the new technology benefits the accuracy of color rendition. The CROMA2 and MICROPRO2 panels are very similar, except that the CROMA2 offers variable color temperature so that it can work in both tungsten and daylight situations – as well as those in between. Using a mixture of daylight and tungsten LEDs, the dominance of colors can be controlled via a continuous dial between 3100K to 5600K. The CROMA2 has a maximum output of 900lux, while the MICROPRO2 can manage 940lux. The SPECTRA2 is a smaller panel with a maximum output of 650lux, and is daylight only. A dimmer switch allows its power to be reduced to 50%. There is a range of diffusers and colored filters available for each of the panels, and they all run from 6 AA type cells, an AC adapter or an L-Type Li-ion battery. They all have a ball and socket tripod head included, and the larger panels come with AC adapters and a bracket for an L-Type battery. For the SPECTRA2 these are optional extras. The SPECTRA2 costs $219.99/£154.95, the MICROPRO2 $349.99/£259.95 and the CROMA2 is $418.99/£329.95.